"Naiad" © 1994, Charlotte Warr Anderson. 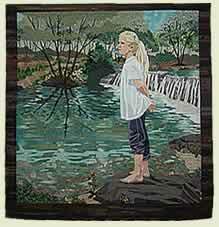 60" x 60"
Programs like "The Art of Quilting" are possible because of support from viewers like you. Thanks for supporting your public television station. are productions of Wisconsin Public Television. © 2000-2007. All rights reserved. Published March 2007.